It is no secret that I love my dogs more than anything, but I could honestly do without some of the messes they make. I could pass on the accidents, muddy paws, and Luna’s very strong desire to empty the trash can all over our kitchen and dining room. While I don’t love having to clean up, I do hold some of these messy situations close to my heart as strong memories with my dogs. Now that they are all cleaned up, I can easily laugh and smile about them. The key to that? 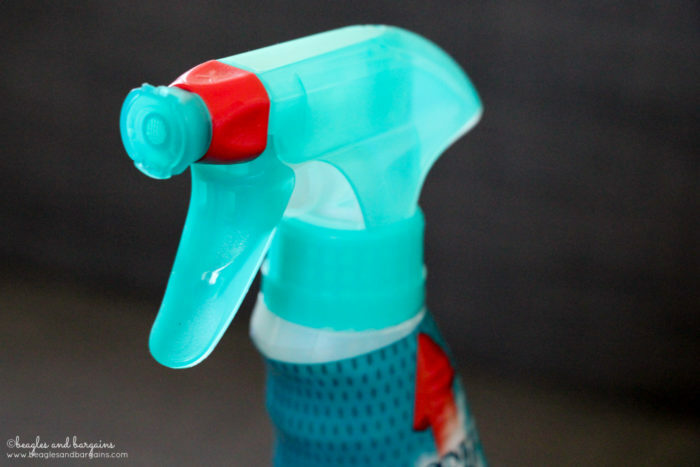 Having an easy to use and reliable cleaner for the specific mess. This post is sponsored by Simple Solution. I am being compensated to help share information about Simple Solution, but Beagles & Bargains only shares information we feel is relevant to our readers. And that’s why I keep turning to Simple Solution when things get messy. Simple Solution products have been there for me when Ralph had a few explosive incidents, when Luna sought revenge on us for clipping her quick by tracking blood all over our apartment, and when the two worked together to smoosh more than a few rotten strawberries into our dining room carpet. Dogs are fun, aren’t they? If you’re like me and you think you don’t have to have a dirty home just because you have pets, then I urge you to check out Simple Solution. 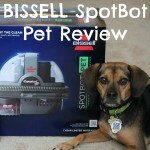 The best part is they recently launched eight products at Petco stores and online, so that you can easily pick up solutions to your cleaning needs or order them to be delivered straight to your door. The eight products available at Petco are formulated to target different types of pet messes. For tough stains, you may want to consider the Oxy-Charged Stain & Odor Remover (affiliate link). 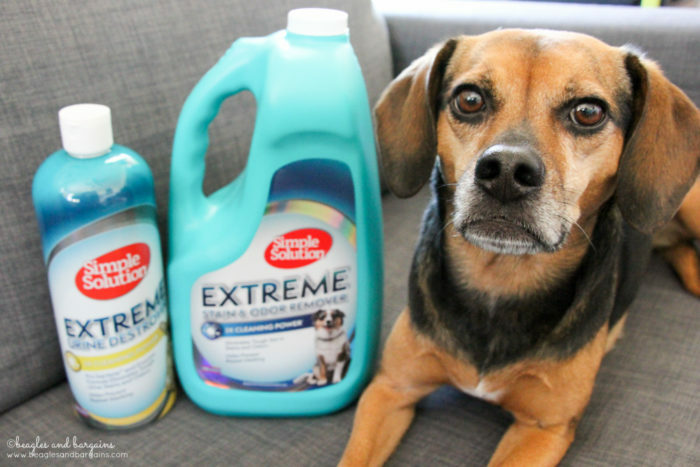 The oxidizing agents in this formula get rid of some of the toughest pet stains including vomit, blood, and feces. If your pup has frequent accidents, then urine might be your biggest problem. If so, Simple Solution has two options – the Urine Destroyer Continuous Spray and Extreme Urine Destroyer. The Urine Destroyer Continuous Spray (affiliate link) is an aerosol with a continuous, powerful spray to get deep down into carpet fibers to get to the source of odors. The Extreme Urine Destroyer (affiliate link) uses concentrated pro-bacteria and enzymes to break down urine organically. 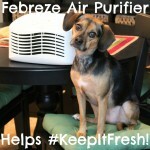 Talking about bad odors… Simple Solution has you covered for that too! 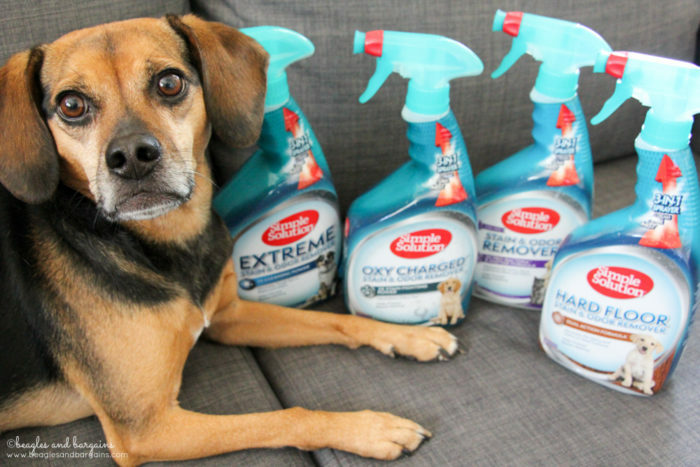 If your pets left behind some unpleasant smells, try tackling them with the Odor Destroyer Continuous Spray or the professional strength formula – Extreme Stain & Odor Remover. Just like the Urine Destroyer Continuous Spray, the Odor Destroyer Continuous Spray (affiliate link) is powerful enough to get deep into the carpet to more effectively remove bad odors. The Extreme Stain & Odor Remover (affiliate link) is available in two sizes including a gallon refill (affiliate link), so you never run out!. 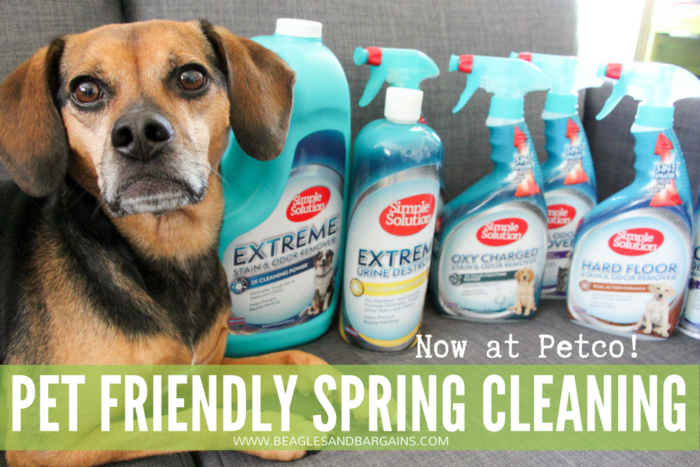 And for the everyday pet messes, Simple Solution has two more options available at Petco – Floral Fresh Stain & Odor Remover and Hard Floor Stain & Odor Remover. The Floral Fresh Stain & Odor Remover (affiliate link) also uses a pro-bacteria and enzyme based formula to break down pet stains. Plus, the floral scent leaves the house smelling fresh! I cannot tell you how excited I am about the Hard Floor Stain & Odor Remover (affiliate link). In our current home, the two bedrooms are the only rooms that actually have carpet. That’s normally great, but when there are messes on our vinyl flooring we need some way to clean it up! I’ve definitely been waiting for this product! 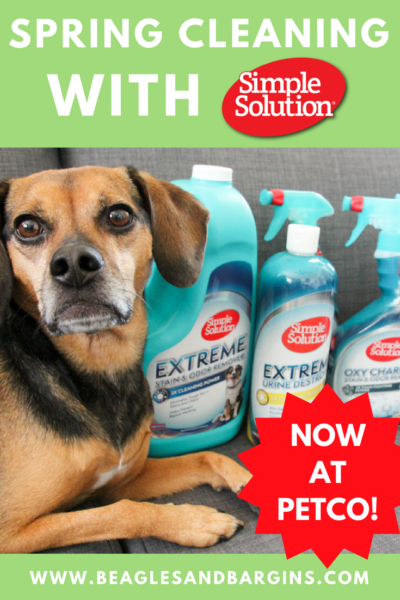 You can view the entire Simple Solution collection at Petco here (affiliate link). You can view all of Simple Solution’s products here. The 32 oz Spray Bottles feature a brand new 3-in-1 sprayer that can do Foam, Mist, and Stream. 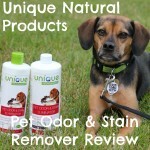 This gives pet parents different options for treating different kind of stains and odors. Generally, foam is for embedded stains, mist is for surface stains, and stream is for odor control. 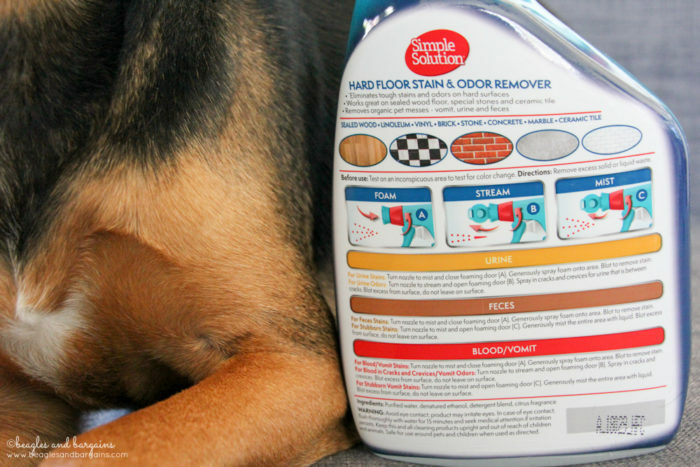 Each product also has a great break down on the back letting pet parents know how to use it to treat different types of stains. For example, the Hard Floor Stain & Odor Remover recommends using the foam for urine stains, but if urine odors persist using the stream and focusing on cracks and crevices in the flooring. Not only was Simple Solution super innovative with their new sprayer, but the updated instructions truly make cleaning up pet messes easier! If you want to learn more about Simple Solution, be sure to follow them on Facebook and Twitter! 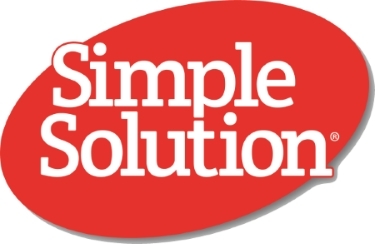 Don’t forget to check out the Simple Solution website for more information about their products. For even more cleaning tips, check out their free ebook! 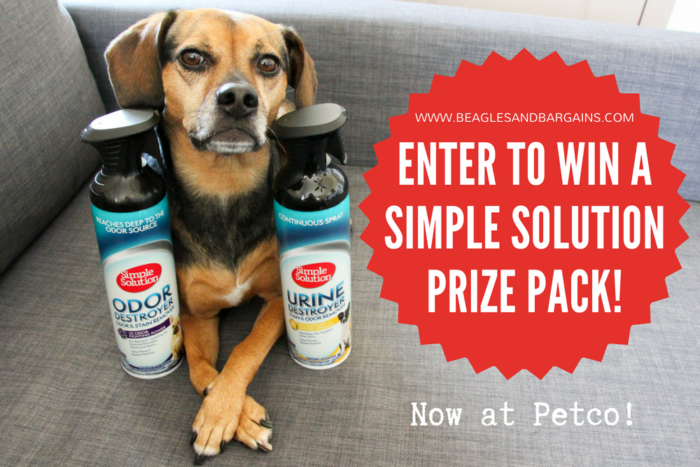 THREE lucky Beagles & Bargains readers will receive a Simple Solution Prize Pack! Residents of the United States are eligible to enter via the Rafflecopter below. Entries must be submitted by 11:59 PM EST on Friday, May 25, 2018. Winners will be notified via email within 48 hours of the giveaway closing and will have 48 hours to respond and claim their prize. 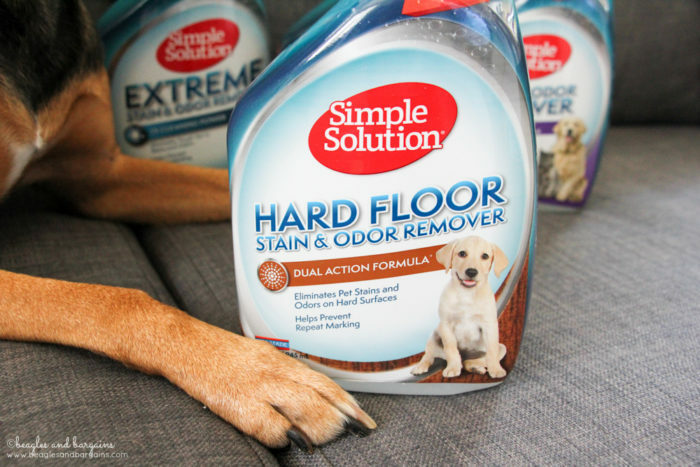 Three (3) winners will receive a Simple Solution Prize Pack containing one (1) Oxy-charged Stain & Odor remover, one (1) Urine Destroyer, one (1) Odor Destroyer, and one (1) Hard Floor Stain & Odor remover. Approximate retail value is $42.86. What’s the biggest mess your pet has ever made? Like this post? 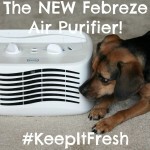 Help spread the new Simple Solution products at Petco by pinning the image below on Pinterest! Disclaimer: Simple Solution provided product free to review. 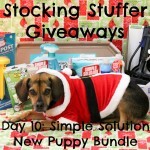 I am being compensated to help spread the word about Simple Solution products at Petco. I received no other compensation or additional benefits for mentioning the brands or products in this post. The opinions and ideas in this post are my own and are uninfluenced by any other person or business. Simple Solution is responsible for all giveaway prizes including shipping. Affiliate links are used in this post and I may receive a commission if you click and/or purchase from the link to help support this blog. Do not worry, these links do not affect the price of products.